The Glenmorangie Original is a collaboration between the Scotch brand a Portland's Renovo Hardwood Bicycles. Thanks to generations of tipsy writers and boozy musicians, whiskey is undeniably cool. As a result, making things out of old whiskey barrels is pretty cool too, be it a badass guitar, a snuggly dog bed, or as Glenmorangie has done in the past, sunglasses. Now, in what is being proclaimed as a "world's first," the Scotch brand has teamed up with the Oregon-based Renovo Hardwood Bicycles to create a bicycle frame built with staves from old Glenmorangie whiskey casks. Already known as "the original performance wooden bicycle company," Renovo is a logical collaborator for this "Glenmorangie Original" bike. 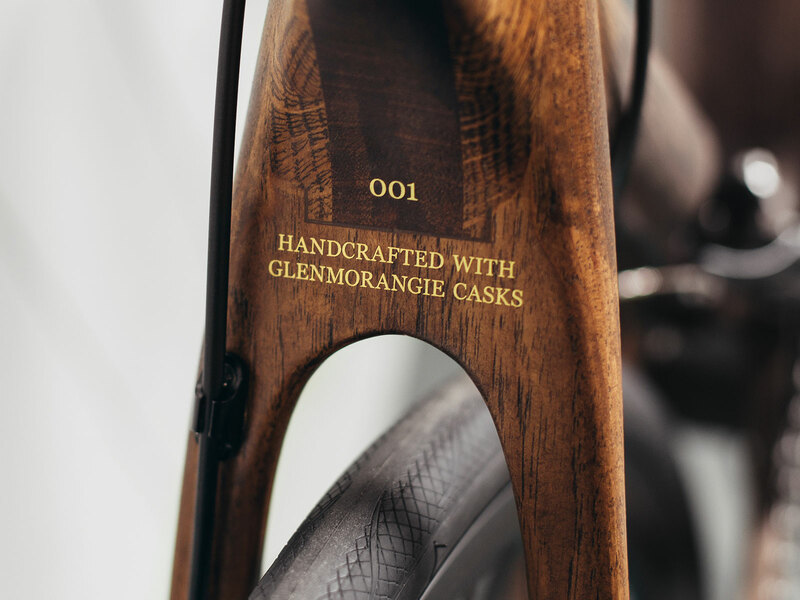 Each bicycle is handcrafted from 15 Glenmorangie cask staves, and Renovo took its inspiration from the design of the Scotch barrels, "with the downtube and top tube echoing the trapezoidal shape of the stave and the arcing curve of the cask." As a result, Renovo states, "In giving a new life to the material this partnership creates a supremely functional machine with a history; and a future, of creating enjoyment." As you might expect from a handcrafted hardwood bike made in Portland, Renovo's rides ain't cheap. A complete mountain bike from the brand starts at $4,995. Meanwhile, you're not going to walk with one of their Glenmorangie bikes for less than $6,950. If you're planning on purchasing one as an impulse buy, maybe fire up a glass of straight Glenmorangie to loosen your nerves and your wallet a bit beforehand. At the same time, if you were on the fence about just how cool a whiskey barrel bicycle might be, Renovo's founder Ken Wheeler was ready to give you the hard sell. "Each one of these limited-edition bicycles is a fitting celebration of our expertise in wood and shared passion for creativity," he said in a statement. "Renovo is dedicated to honoring wood in the creation of our bicycles, engineered to perfection for a smoother ride. And these beautiful machines, uniquely fashioned from Glenmorangie's staves, will inspire anyone with a taste for innovation." A taste for innovation and Scotch, that is.